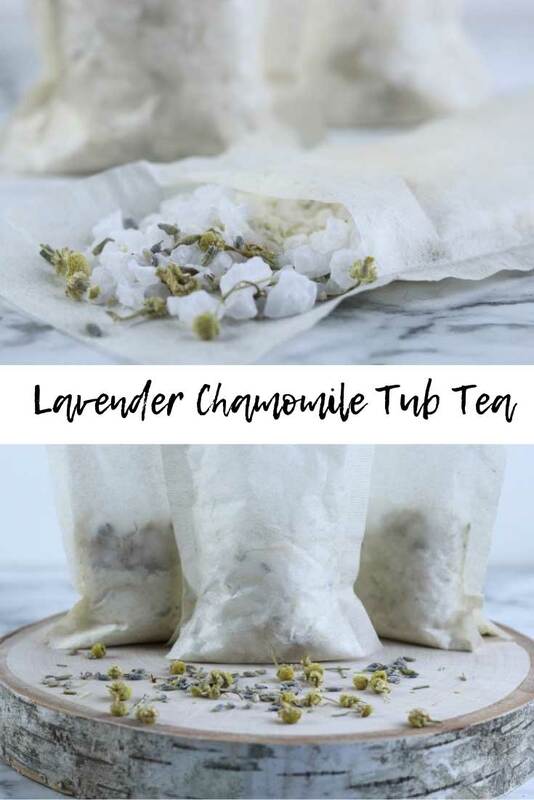 This lavender chamomile tub tea recipes uses herbs and essential oils to naturally relieve dry skin. The last two weeks have been brutal on my skin. We were at the edge of the polar vortex, and we had temperatures below zero with the lowest wind chill at -30 degrees! We burn wood for heat, which makes the air very dry. We had a fire going pretty much all day and night for a few weeks, so the house was crazy dry. We were putting water back in the air with a cool mist humidifier in the bedrooms and living room, but it wasn't enough. My daughter and I were scratching constantly from dry skin. We used lotions and oils, and I made this lavender and chamomile tub tea recipe for dry skin. This recipe is easy to make, and you can make several bath teas at once. This is a great way to relax while you soothe your dry and irritated skin. I selected each ingredient for this lavender and chamomile tub tea recipe for its benefits for dry skin. I'll also give you other options to use if you want to swap out some of the ingredients. This recipe will make about 6 tub tea bags. Some bath teas use Epsom salts, and I normally do use them for the extra magnesium, but I think sea salt is better for dry skin. Sea salt is mined from the sea. When the salt water evaporates, this is what's left over. It's high in minerals, and the mineral content depends upon where it came from. Most sea salts are high in potassium, which can help promote healthy skin. The sodium can boost circulation of lymphatic fluid. Sea salt does have some magnesium in it. It helps promote cellular turnover and makes the skin more permeable to keep the skin hydrated. I like adding powdered milk to my bath soaks because it has key benefits for your skin. I used powdered cow's milk, but you can use powdered goat's milk too. Milk is said to cleanse your skin to help it look better. It can also help boost cellular turnover and boost collagen production. Vitamin B6 in milk powder moisturizes the skin while the vitamin A promote cellular turnover. Baking soda is optional, but I use it because I have hard water. It helps soften water and gives the water more slip. It also helps exfoliate the skin for better looking skin. I added dried lavender because it smells amazing and has skin benefits, especially for dry skin. Lavender is naturally anti-inflammatory, so it can soothe irritated skin. Lavender can help you calm down and relax, so I like adding it to bath products. Chamomile is my favorite herb for irritated skin. 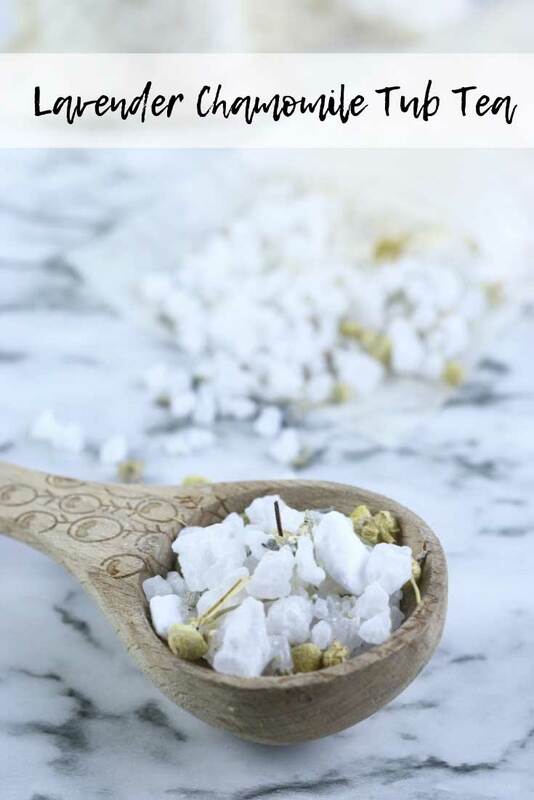 It's naturally anti-inflammatory to help soothe your irritated skin. It's high in antioxidants to promote younger looking skin. I grow my own chamomile. It's so easy to grow. Just plant it and forget it until it's time to pick off the buds to dry. I've even had it come up the the next year before I could even plant the seeds. 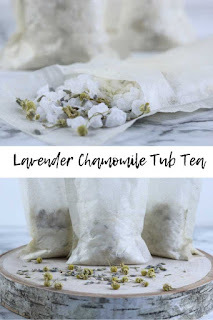 I used helichrysum for this lavender chamomile tub tea recipe for dry skin, but you can also use lavender, German chamomile, or frankincense. Helichrysum is a gentle oil, so it's a great essential oil to use for sensitive or irritated skin. It can actually moisturize your skin without making your skin oily. It promotes cellular turnover and is naturally anti-inflammatory. It's also antibacterial, which is important when you've been scratching your skin. You can also use lavender essential oil . Like the herb, it's anti-inflammatory. It also helps moisturize and soothe dry skin. Frankincense has healing properties. If you've scratched your skin, this is a good oil to use to promote healing. German chamomile essential oil can help calm red or itchy skin. It's a good skin for dry skin because it can help soothe your skin and reduce redness and itching, and it's gentle for irritated skin. You could add this recipe directly to your bath, but the herbs can make a mess. We have a septic system, so I don't want the herbs to do down the drain. I used the tea bags I use to make my herbal infusions. I picked them up at iHerb. My readers get a discount and new customers get $5 off a $40 purchase. They have free shipping on orders over $20. Use my link to get your discount. You can also find tea bags on Amazon that have a drawstring on them. Combine the sea salt, powdered milk, baking soda, lavender, and chamomile in a bowl. Spoon 4 tablespoons of the tub tea into an empty tea bag. Some of the baking soda and powdered milk will go through the tea bag, so you'll want to store these in a bowl or something that will catch the powder. It's not extremely messy, but I wouldn't leave them on a shelf or in a drawer. Drop a bag in the tub, fill the water, and enjoy a relaxing bath. When you're done, remove the tea bag and toss it. I like filling the bags and storing them for when I need them. You can also mix it up and put it in a jar and fill the bags as you need them. Some of the baking soda and powdered milk will go through the tea bag, so you'll want to store these in a bowl or something that will catch the powder. It's not extremely messy, but I wouldn't leave them on a shelf or in a drawer.